The UNECE regional GTF report tracks progress towards the objectives of Sustainable Development Goal #7 “to Ensure Access to Affordable, Reliable, Sustainable and Modern Energy for All” (SDG 7). Building upon the three SDG 7 pillars of renewable energy, energy efficiency, and energy access, the report goes further to present additional information about the current status of sustainable energy within UNECE sub-regions. The report finds that, overall, the achievement of all three SDG 7 goals is not on track, and that efforts need to be accelerated if the UNECE region is to achieve the SDG 7 targets by 2030. The report further introduces the Energy for Sustainable Development framework that highlights energy as the golden thread linking energy-related Sustainable Development Goals across the 2030 Agenda for Sustainable Development. The framework analysis leads to the conclusion that a broader set of energy indicators is required to track energy for sustainable development comprehensively, including indicators covering climate, fossil fuels, and water related metrics, among others. This UNECE report is one of five regional reports on progress towards the objectives of Sustainable Development Goal #7. 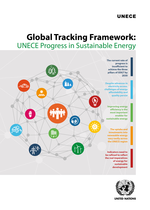 It hereby builds upon UNECE's contribution to the 2017 Global Tracking Framework report, which includes regional chapters prepared by the United Nation’s five Regional Commissions. The global report is published by the World Bank and the International Energy Agency. See more information under http://gtf.esmap.org/.